Having trained and served in Ohio, Oregon, Alaska and Russia, t he Emricks now serve faith communities throughout the State of Alaska, by developing a broad, unified training initiative, and by marshaling relevant resources. Their long-term vision sees Alaska become a major “sending state” that supports trained, inter-cultural, social-change workers. After Barbara graduated from high school, she enlisted in the Army where she spent three years of the Cold War in Baumholder, West Germany, as a cook. When she returned to the U.S., she took advantage of the GI Bill and gained a degree in Nursing. As a nurse’s aid and nurse, Barbara has worked in pediatrics, oncology and geriatrics. Meanwhile, her volunteer work included bussing for the handicapped, and social service for children. After their marriage in 1987, Frank earned a Masters degree in inter-cultural studies. 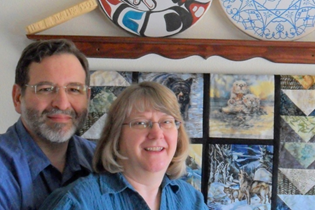 One of their earlier work assignments took them to make their home in a native village of Alaska. This helped to prepare them for their move, in 1996, to Yakutia, Siberia Russia with their three children, where they remained nine years. There they served in local institutions as English-language instructors and local capacity building, eventually becoming regional directors. Back in Alaska, in 2007, Barbara became a Special Education Assistant at the local High School, serving physically and mentally-challenged students in Life Skills classes. Frank’s bi-vocational service has involved seasonal farm work and chauffeuring, as well as substitute teaching and classified positions within High and Middle schools, while coordinating an adult, continuing education program. After the Emricks sponsoring agency resolved, in early 2011, to dissolve, Frank and Barbara came to CVI² in order to continue their present work and to strengthen it.